Data loving families considering Boost Mobile will need to act fast as rates are set to go up for select plans according to a report from Prepaid Phone News. 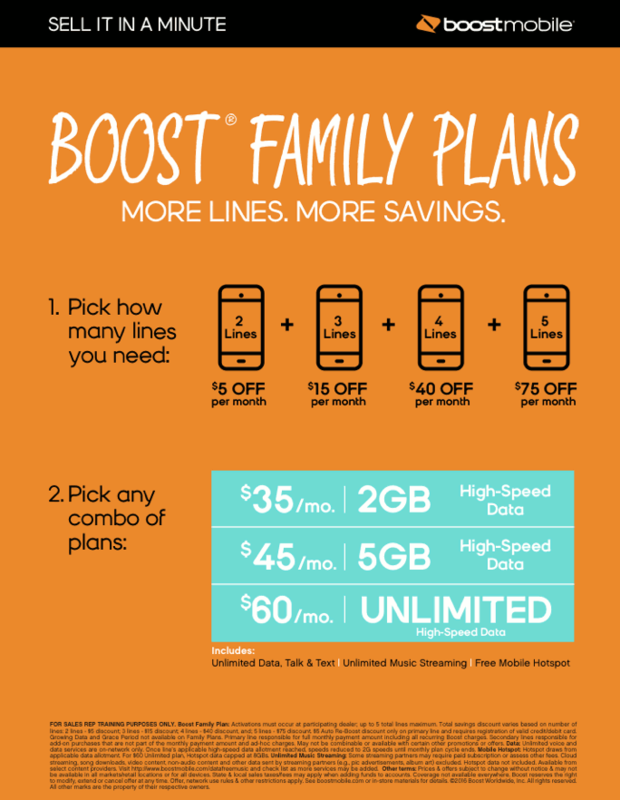 Starting on April 20th, Boost Mobile's current family plan rates are set to go up, but there's not all bad news as the Sprint owned MVNO is also releasing unlimited LTE family plans and a new family plan offering 2 GB of high speed data per line. The prepaid provider is also increasing the number of lines allowed per account from four to five. A 5th line can now be added at a cost of $145. Five lines will now be available for $95 as well. All the prices I have listed for all the different tiers of data include a $5 auto pay discount. All data tiers include mobile hotspot, and unlimited music streaming. The plans without unlimited LTE data have unlimited data that gets throttled to 128 Kbps once the plans high speed allotment is used up. An additional $5 can be taken off your bill by enabling auto pay. Unfortunately, these plans will only be available through Boost Mobile stores, and independent dealers, not online or through big box stores such as Walmart. Those looking to switch from a carrier other than Sprint or a Sprint MVNO are eligible to receive a $50 bill credit for porting in. It will be interesting to see if and how T-Mobile's MetroPCS brand as well as AT&T's Cricket brand respond to Boost Mobile's new plans and port in deal. What do you think? Time to switch to Boost?